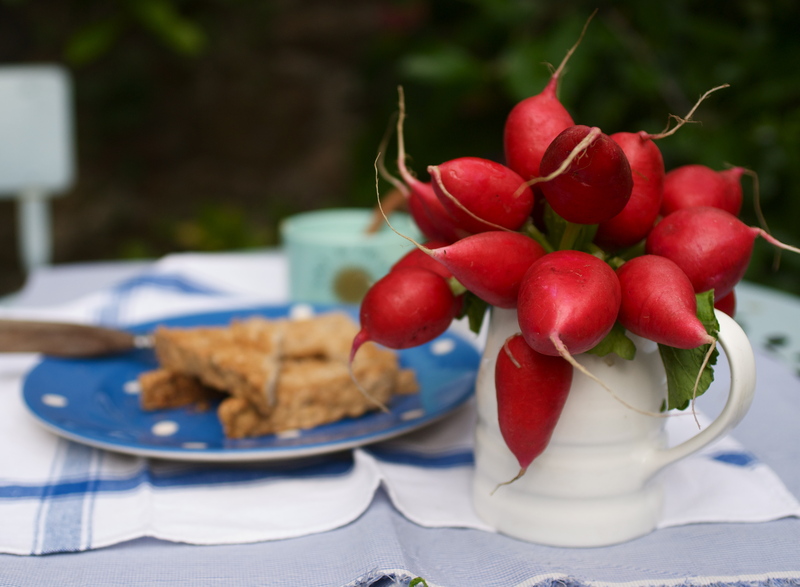 Radishes are one the great summer treats- just fabulous with a bit of unsalted butter and some crunchy salt. The idea of serving them like a flower arrangement came from perhaps the glitziest restaurant I’ve ever been to. St Tropez’s Le Club 55 is the most ludicrously expensive, super -chic beach bar in existence…….and we arrived by helicopter! It’s seems like a different lifetime as I sit in my tiny back garden and think back to my super-yachting days. I worked aboard an Italian owned sailing boat as the cook and the owners did, just once in a while, invite us to partake in their bonkersly swanky lifestyle. Our trip to Club 55 (please think it in French or it just doesn’t work) was to celebrate the re-fitting of the boat’s main mast – quite a hairy business which involved cranes, plenty of manic arm waving and lots of filthy French swearwords. I’d been given the important job of filming the event for the owners who’d wisely decided to miss the action. The first lesson in filming: never turn a camera on its side even if the tip of the mast doesn’t fit into a landscape shot. You had to watch the entire video with your head cricked to one side…… very irritated Captain and THANKFULLY highly amused boss. The family popped into the boat yard in their helicopter to look over their beautiful yacht before flying on the extra few miles to Pampelonne beach. I leapt at the chance to hover over St Tropez and then spent most of the time with my eyes shut, virtually hyper ventilating; there’s nothing I hate more than flying. So we landed in the car park next to the Ferrari’s and Lamborghini’s and made our way out into the shady, understated beachside restaurant. There on every table was a jug of radishes, some butter, salt, aioli and a basket of perfect baguette. The extraordinary thing is that I have no memory of the rest of the meal, I was probably too busy people watching. So it just goes to show that the simplest, quickest thing to prepare can often make the most impact. The week before I took the picture I’d found some of those slender, pink French breakfast radishes with their long whispy tails, they’re my favourites, not today. But, any good radish with leaves intact can be bunched together tightly with some string and pushed into a squat jug or bowl. Talking of lapping up the simple things in life I have to share these pictures of Reg with you. Every year Peter hopes to hand feed a robin, he’s had no luck for the last couple but then Reg arrived. The trick is patience; when the robin is feeding its young it will be bolder than usual and so, by placing a small plate of live mealworms close by and waiting motionless whilst it feeds, the robin will gain confidence. Then it’s a question, over about a week, of moving the plate closer and closer until you’re holding it. Eventually the robin will land on your hand and even flutter outside the kitchen window until you come out to feed it. We’re just hoping that Reg will be back again next year to feed another brood. The thrill of holding such a delicate little bird on your hand is extraordinary. So light, so perfect. A hundred years ago I had a very pretty Greek girl-friend who introduced me to radishes and butter. Now, I wouldn’t dream of eating them any other way – and when I do I always think of Maria! I love food memories, when a taste or an ingredient just transports you. I’m sure that Maria would be very touched!And yes, radishes and butter – simple but heavenly.